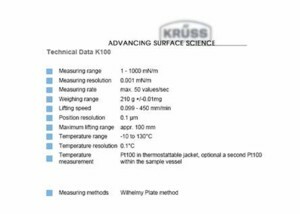 In a recent study conducted at Augustine Scientific Research Center, surface tension as a function of concentration for CELLFOOD® in a glass of water was measured using a Kruss Processor Tensiometer K100 with automated dosing. The surface tension of ordinary tap water is approximately 73 mN/m (dynes/cm). The surface tension of extracellular body fluids is much lower at approximately 40 mN/m (dynes/cm). This low surface tension is critical to healthy cellular function, absorption of nutrients, and the removal of toxins. A higher liquid surface tension causes the surface to act like a stretched elastic membrane inhibiting absorption while increasing molecular resistance. The surface tension of the tap water (control) was calculated to measure 72.8 mN/m (dynes/cm). Two separate controlled dilution experiments were conducted simultaneously; one as drops per 8 oz. 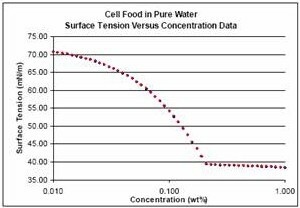 of water, and the second as %wt stock solution of CELLFOOD®. The results were statically identical; in both tests, CELLFOOD® was shown to reduce surface tension to 40 mN/m (dynes/cm), the same surface tension of extracellular body fluids. It was observed by Dr. Christopher Rulison, Ph.D., that using Avogardo's multiplication number of 6.02 x 1023 molecules/mole gives the value of 51 billion surface active molecules per square millimeter at the surface of a glass of water containing 8 drops of CELLFOOD®. Dr. Rulison also noted regarding the molecular dimensions of CELLFOOD® (4-7 nanometers in size), "we figure a standard molecular radius of gyration as (length)3/2 then your enzymes and amino acids could be expected to occupy between 43/2 = 8.0 sq. nanometers and 73/2 = 18.5 sq. nanometers each at the surface. However, since a square nanometer = 1012 sq. nanometers, each of the 51 billion molecules at the surface has19.6 sq. nanometers of free space - more than is necessary for complete rotation." An unfortunate but common necessity for nutritional supplement manufactures known as denaturing (packing 3-5 times the amount of protein at a surface that a radius of gyration argument would follow) to assist with absorption. 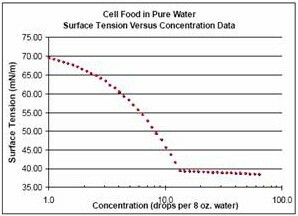 Because of the specific hydrophobic residues and small molecule surfactants, CELLFOOD® can pack in surface spaces upwards of 50 to 100 times below its radius of gyration in water; denaturing is not necessary due to its amphipathic nature.